The Hobgoblin was created by Roger Stern and John Romita Jr. and debuted in Amazing Spider-Man #238. Stern created him in response to reader demand to bring back the Green Goblin. Not wanting to resurrect Norman Osborn, who was dead at the time, Stern decided to create a new character using all of Osborn’s goblin equipment. Thus was born one of the most popular villains in the mid-1980s (and a personal favorite of young Back Issue Ben). The identity of the Hobgoblin was kept secret, also a nod to those original Green Goblin appearances. Stern had always intended to reveal Roderick Kingsley, another creation of his, as the Hobgoblin, using a complicated plot involving Kingsley’s almost identical (not twin) brother. Stern kept this plan a secret, even from his editor, Tom DeFalco. 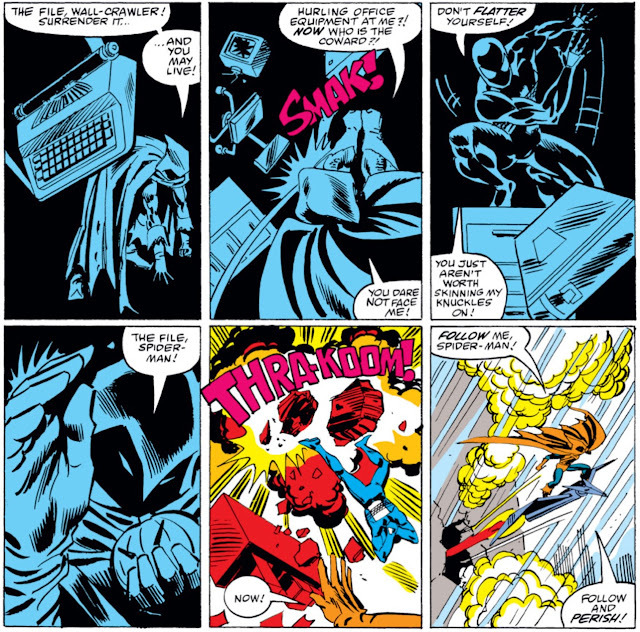 When Stern left the Spider-Man book to write Avengers, he left the identity of the Hobgoblin unresolved, and DeFalco himself would become the writer of the book. When he conferred with Stern about his plan, DeFalco didn’t think the Kingsley brothers would have enough impact for the readers (and he was eventually proven right). 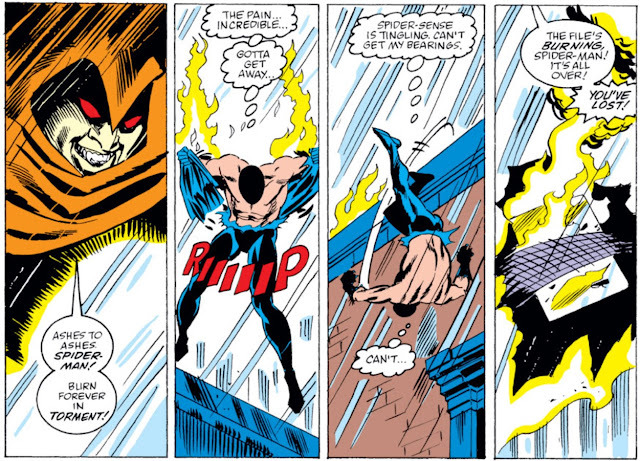 DeFalco pushed ahead with his own plan, with Richard Fisk as the Hobgoblin, and Roderick Kingsley as the Rose. (Pretty ironic considering that when it was all said and done, Fisk was revealed as the Rose and Kingsley as the Hobgoblin.) This was perfectly fine with Stern, and new editor Danny Fingeroth had no problem allowing DeFalco to keep his plans a secret. Unfortunately, Jim Owsley took over as editor, and differences between him and the creative team started almost immediately. Owsley claimed that DeFalco and Frenz were always late, leading to fill-in issues and substitute creative teams. DeFalco claimed that Owsley was purposefully changing the production schedule to sabotage the book so he could fire him. 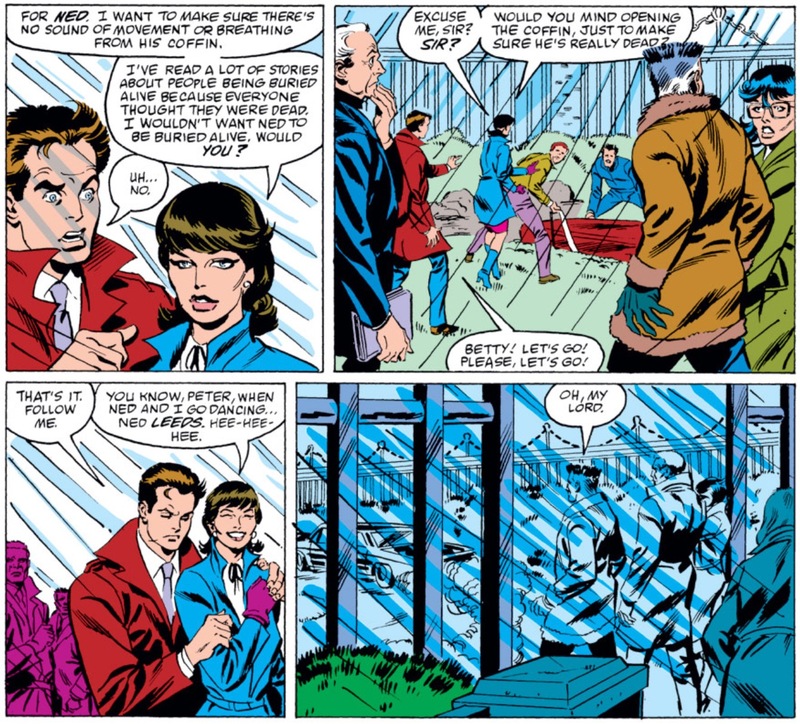 During a story conference for the Spider-Man books, with other writers present, Owsley demanded that DeFalco tell him the identity of the Hobgoblin. Just to get Owsley off his back, DeFalco told him Ned Leeds, never intending that to be the actual reveal. But as the months went on, one of the results of Owsley’s constant interference was the cutting of all of DeFalco’s scenes with Richard Fisk, which he was using to establish the character as a viable suspect. What was left was mostly only the “red herring” clues pointing to Ned Leeds, which wouldn’t have been a problem, except for what happened next. Owsley fired DeFalco from the book. Most likely because (in an ultimate move of attempted dickery) Owsley had Ned Leeds killed in the Spider-Man vs. Wolverine one-shot and didn’t want to have to face DeFalco and Frenz afterwards. 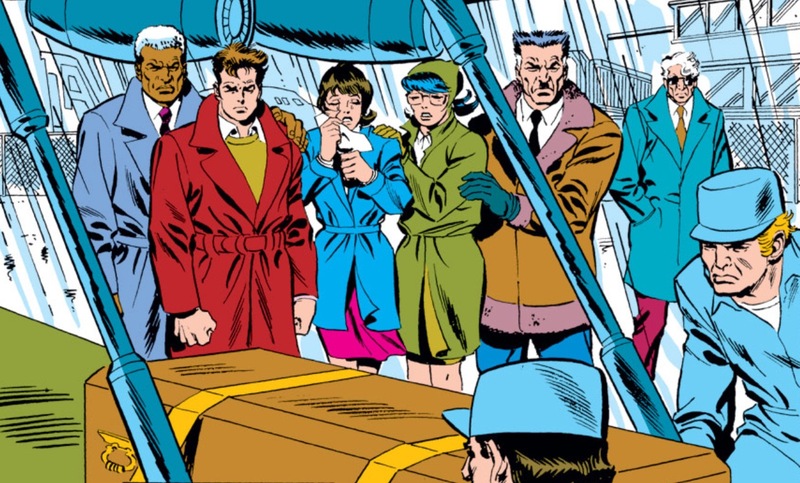 Joe Robertson, Peter Parker, Betty Brant, Marla Jameson, and J. Jonah Jameson supervise the unloading of Ned’s casket, having arrived by plane from Berlin. Peter consoles a distraught Betty as best he can, catching a glimpse of the Hobgoblin in the skies above.At his skyscraper headquarters, the Kingpin plays a game of chess against the Foreigner. He is not happy that the Foreigner killed the Hobgoblin without getting his approval. The Foreigner does not care, he was hired to do a job and he did it. 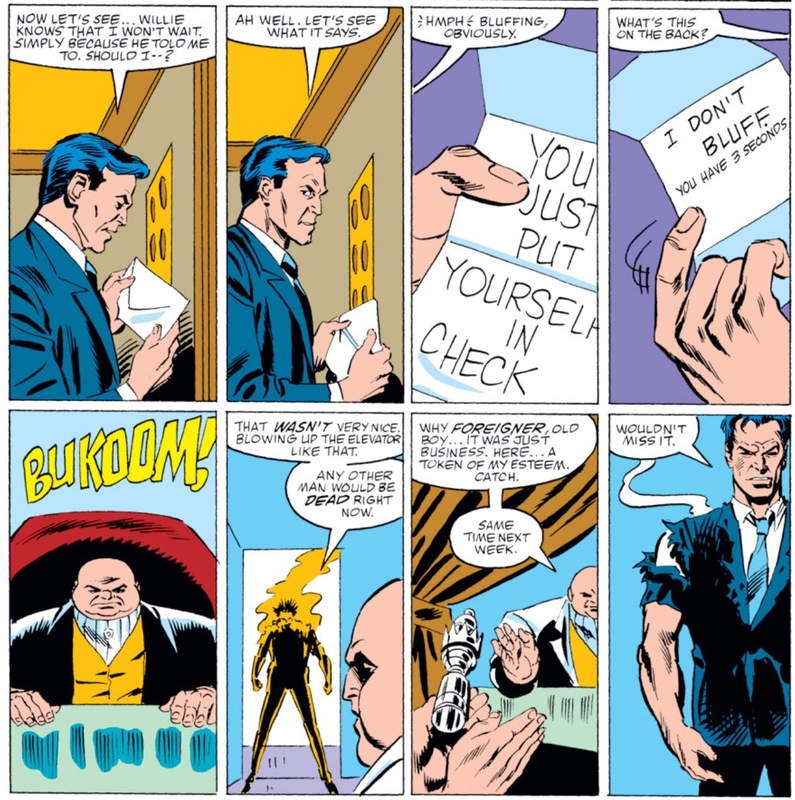 Kingpin is none too happy with the Foreigner’s disrespect, and after he leaves, has his secretary fetch his file on the Hobgoblin. I have to say that I’ve never seen Kupperburg’s artwork look better than it does in this issue. The next day, Peter and Betty are at Ned’s funeral. Betty is particularly out of it, worried that Ned will wake up trapped in his coffin, and makes a lame joke as they leave. I was always pretty unnerved by Betty’s mental trauma as a kid. The Rose returns to his headquarters to find that his faithful lieutenants, Johnston and Varley, have been murdered. Young Back Issue Ben thought this was a scary scene, but offset with a dash of humor due to the Rose’s nonchalant responses. This combined with crazy Betty is almost certainly the reason why I should be medicated right now. The Rose turns around to find the Hobgoblin, looking much creepier than he’s looked in the past. I always thought the tattered cape was a nice touch, and helped create a look that differentiated between the two Hobgoblins. The Hobgoblin threatens to kill the Rose, but the Rose diverts him by informing him of the Hobgoblin file that the Kingpin is about to show to his most hated enemy, Spider-Man. The Hobgoblin speeds off. Spider-Man is in the Kingpin’s office. 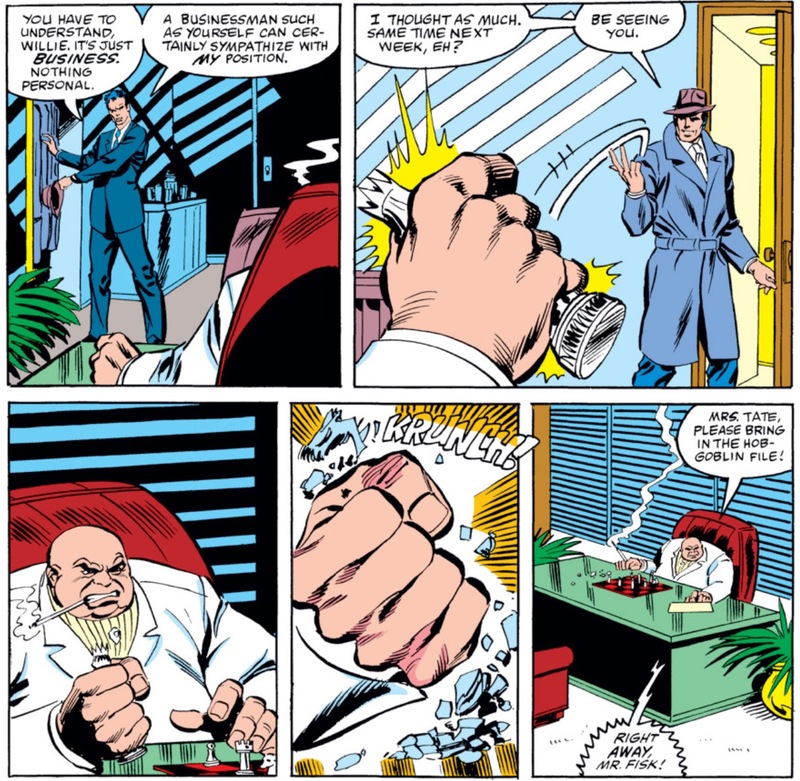 The Kingpin gives him the Hobgoblin file, and leaves his office to allow Spider-Man to review it alone. Outside, the Kingpin kills one of his own men, for being a spy for the Rose. Spider-Man cries out, the contents of the file dropped to the floor. His mind replays the situation laid out in the photos he’s just seen. They’re in Berlin. He and Wolverine leave the hotel. Ned Leeds is in his room, changing clothes. Outside, a team of assassins surround his room. They come bursting in. Ned is in costume. DeFalco: Later on, Owsley and Peter got together and tried to go through everything to see who else the Hobgoblin could be. And they couldn’t come up with anybody. So that’s why Peter had to do the story that showed, yes, it was Ned. There was no plan, and I blame all that on Owsley and not on Peter. Peter was given the assignment and was trying to do the best he could. DeFalco: Owsley killed off Ned to screw up my continuity. Then he decided to fire me instead. He thought he’d throw me a curve ball by killing off Ned. I would’ve been annoyed about it, but it wouldn’t have been a curve ball for me because I never intended for the Hobgoblin to be Ned anyway. I just knew I couldn’t trust Owsley and this proved it. And I’m thinking, “We’ve got a problem here. I can’t think of anyone it could be other than Ned Leeds.” And I go to Owsley and I ask him, “Who kills Ned in the one-shot?” And Owsley says, “Some unnamed terrorists.” Because this is how much thought Owsley had put into it. So I said, “No, Here’s how we do it. The Foreigner”—and I used the Foreigner because Owsley seemed hot on the Foreigner—“is an assassin. The Foreigner killed Ned because the Foreigner figured out that Ned was the Hobgoblin. 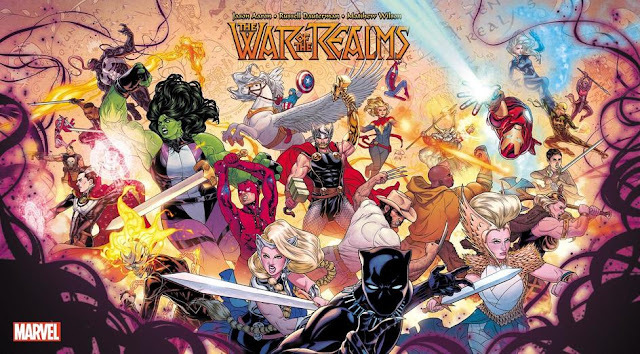 Someone wanted the Hobgoblin dead, and they hired the Foreigner to do it.” And Owsley said, “Well, how did the Foreigner figure it out?” And I said, “Well, he read DeFalco’s issues!” Actually, I said, “We don’t really have to go into details about it. He’s the Foreigner. He has a Hobgoblin file. That’s all you need.” And Owsley said, “Well, who would want the Hobgoblin dead?” And deconstructing it, we decided that the perfect person would be the Jack O’Lantern. They’d already crossed paths, and the Hobgoblin had pretty much handed his head to him (Amazing #288, May 1987). So why would the Jack O’Lantern want to go head-to-head with the Hobgoblin again, when he could hire someone else to take care of the Hobgoblin for him? My argument was, “Once we kill off Ned, he’ll go from being the lead suspect to the last guy you would think of. Because who would be stupid enough to do a story in which we reveal the identity of the Hobgoblin after the guy is dead? And that we never have the big climatic confrontation and unmasking that everyone is expecting and which has been done a hundred times? This has never been done before! Fans are going to go so batshit over this that it’ll never be done again, because it is quite conceivably the dumbest resolution that we could possibly have!” Owsley said, “I love it!” And I was brought in to write the resolution issue (Amazing #289, June 1987). The Kingpin has returned to the office. Spider-Man is confused — if Ned was the Hobgoblin, how did he see him flying over the airport when Ned’s casket was being unloaded. The Kingpin explains that Jason Macendale, otherwise known as Jack O’Lantern, hired the Foreigner to kill Leeds, so that he could take his place as the Hobgoblin. I was still young enough when I first read this, that I took every story at face value. What happened was what happened, and I never had any thought about questioning it, or criticizing it. Ned Leeds was the Hobgoblin and now he’s dead, okay. 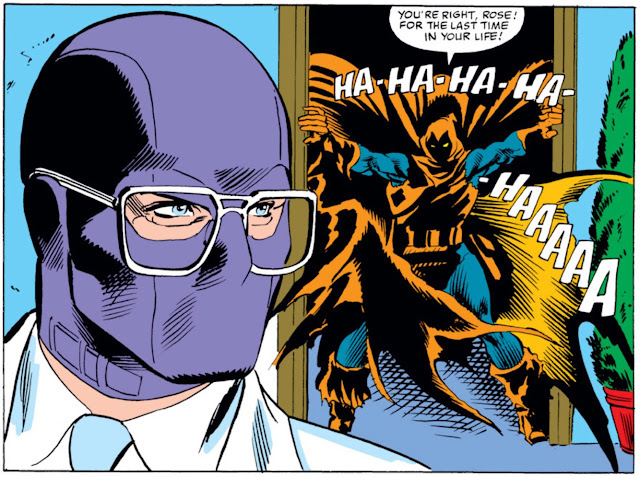 Jason Macendale is now the Hobgoblin, whatever, as long as he still has the orange hood and cape, I’m good. That’s my guy. It was only many years later, probably around Hobgoblin Lives, that I realized they had taken a powerful and compelling villain, and made him into an incompetent, bumbling coward. All I knew was that the new guy’s cape looked cooler. I was young and dumb though, of course the classic Hobgoblin looked cooler. 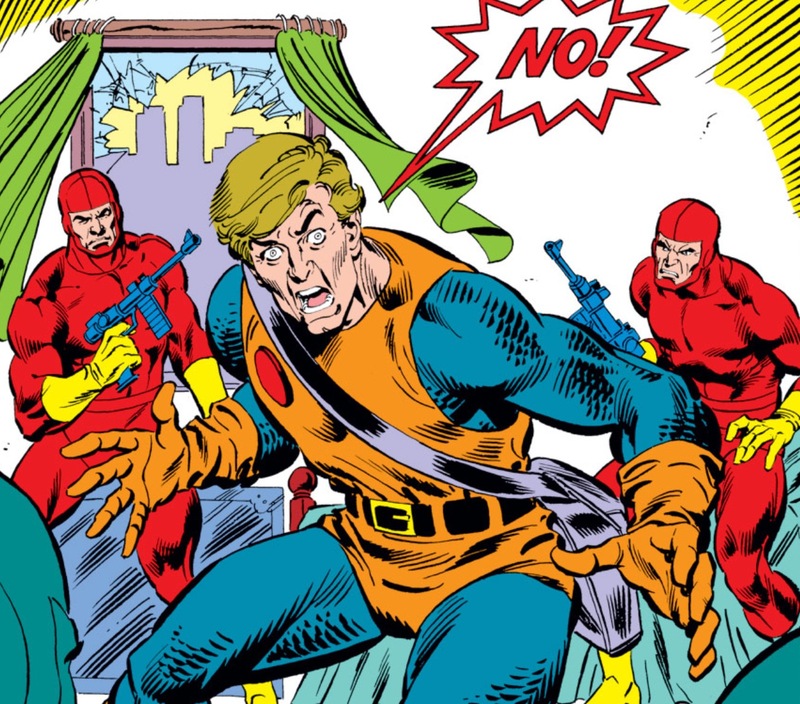 Owsley/Priest: Oh, and suddenly, Ned Leeds was the Hobgoblin, a move that infuriated Roger Stern, but one that I had absolutely nothing to do with. Stern: I wasn’t infuriated at all, I saw it as an opportunity. I realized that the stuff established in #289 could serve as the foundation for a whole new story. DeFalco: How could Owsley have nothing to do with it? He edited the freaking book! David: Owsley had nothing to do with it? Bull. That’s nonsense. He was the editor! Spider-Man leaves to confront the Foreigner. Kingpin leaves as well, making his way down toward the street, and his waiting car. Inside the car, he finds the new Hobgoblin waiting for him. Kingpin lets Macendale know exactly what he thinks of him. Macendale wants the file, and threatens Kingpin to get it. He’s quickly dissuaded by the two or ten weapons currently pointed right at him. Kingpin lets him know that Spider-Man has the file, and he’s on his way to confront the Foreigner over it. 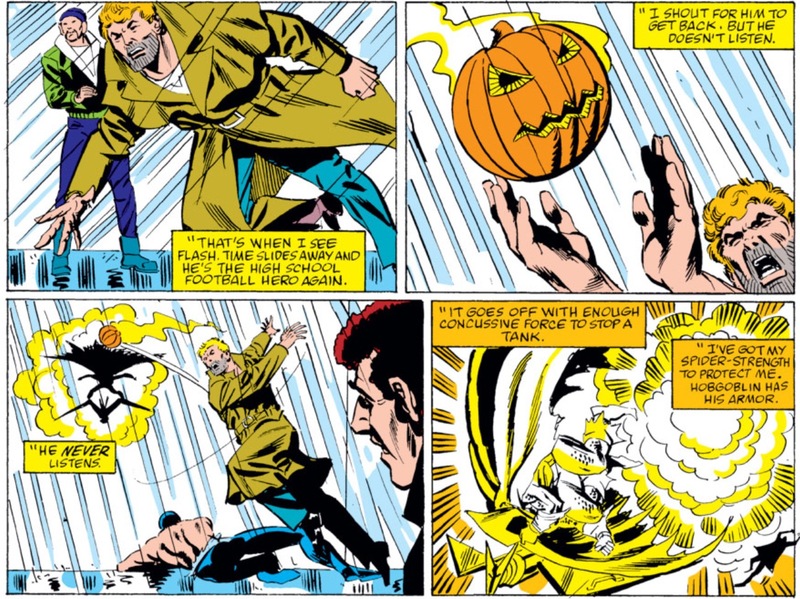 The Hobgoblin takes off after him, leaving behind a pumpkin bomb parting gift that Fisk easily swats away.Flash Thompson sees Spider-Man swinging past, and takes off after him. 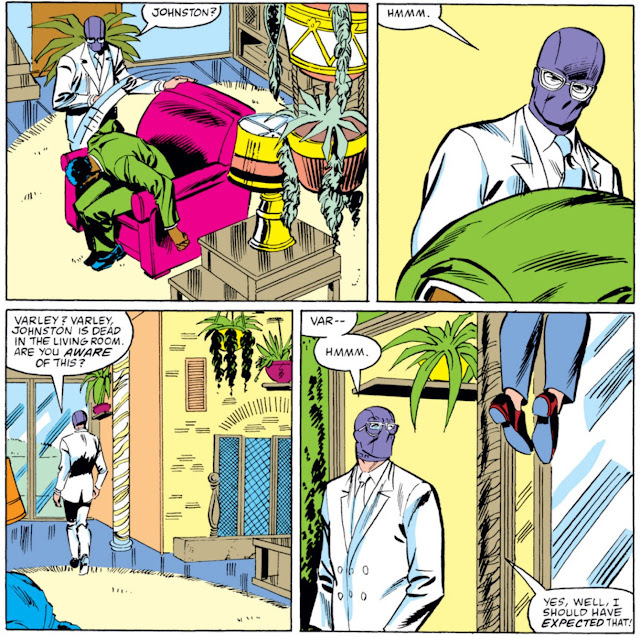 Spider-Man arrives at what was previously the Foreigner’s office, but finds that it has already been vacated, with all traces covered up by the party supplies company currently in residence of the space. Macendale confronts Spider-Man, and they fight. Wow, he’s already pretty incompetent. After the lights are knocked out, Spider-Man is easily outclassing Macendale in the dark, so he is forced to retreat outside. Spider-Man snags him with his webbing, forcing him to crash. He moves quickly to his landing spot, but finds a hallucinogenic pumpkin waiting for him instead. Spider-Man falls to the ground, and Macendale celebrates his seeming victory. But Spider-Man was just playing possum. Inappropriate time for a joke, Spidey. Spider-Man snags him with his webbing again, but Macendale circles around and surprises him with a shot in the back, setting the file he had strapped there, on fire. Peter has to rip his top off to save himself, and the file is burned to a crisp. Spider-Man’s naked, shirtless chest, is one of the reasons I should be on medication now. Spider-Man is reeling, and Macendale throws a pumpkin bomb for the knockout punch. Flash, having caught up to the scene, sees the bomb, catches it, and sends it right back at Macendale, forcing him to retreat. Flash is dying, ready to give in to his fate, but Spider-Man won’t let him die, giving him mouth-to-mouth resuscitation. Later, Peter is visiting a recovering Flash in the hospital. D.A. 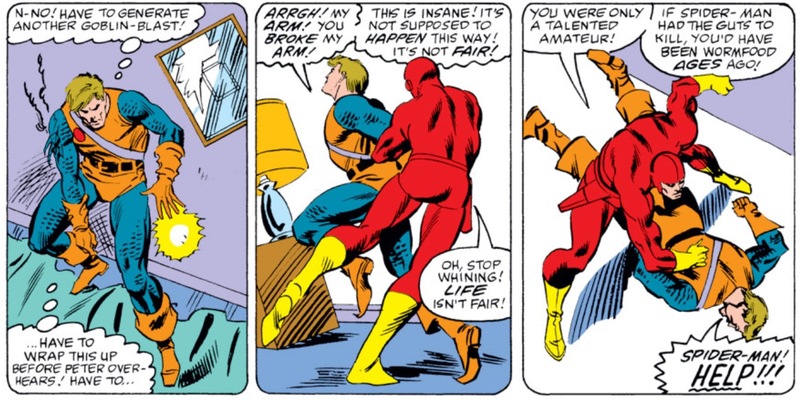 Tower shows up to tell Flash that he’s off the hook, since several witnesses clearly saw he was attacked by the Hobgoblin, corroborating his original story that he was framed. Elsewhere, the Foreigner and Kingpin enjoy another game of chess. 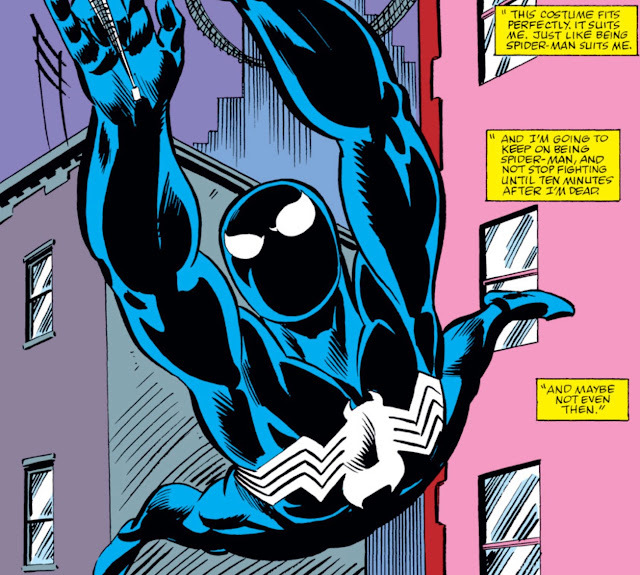 Foreigner praises Fisk on sending Spider-Man after him, even if it didn’t work. Kingpin gets a little revenge on him anyway. Later, in his apartment, Peter talks to Felicia about how both Aunt May and Flash inspired him not to give up. Doesn’t look like a guy ready to propose to a different woman in the very next issue. Just sayin’. After months and months of complaining, Peter has finally decided that he can’t quit being Spider-Man, and swings off into the city. And that was how the saga of the Hobgoblin ended, for a time. Like I said before, I loved this issue when I was a kid. I didn’t care that it was weird, or unsatisfying, or didn’t make sense. The Hobgoblin was my favorite villain, and they finally revealed who he was, and even though they killed him, they gave me another one right away. No harm, no foul. This is one of the comics I’ve probably read the most in my life, so it’s probably really hard for me to be completely objective about it, but I think Peter David did a pretty decent job with the hand he was dealt. There are some really effective scenes, which sufficiently traumatized me as a child to the point where I can’t properly express myself emotionally. However, Roger Stern was convinced that Ned Leeds could never have been the Hobgoblin, and periodically petitioned Marvel editors to let him fix it. Finally, they agreed to let him do it, nearly 10 years after the Ned Leeds reveal. The Hobgoblin Lives miniseries was born. Stern: One of the many things that made Ned not work: the Hobgoblin gets all of the original Green Goblin’s stuff from his informant, Georgie Hill, and then he blows Georgie up. I never would’ve seen Ned doing that. The other thing, of course, was how Ned was killed—four guys jumped him and killed him. Except, the real Hobgoblin was about as strong as Spider-Man. If four guys jumped him, they’d end up as red paste on the wall. And they didn’t! David: The Foreigner’s assassins were no slouches. They caught Ned completely flat-footed. They were on him before he could even make a move. They had a garrote around his throat. I don’t care how super-strong you are, if someone is cutting off your air, super-strength will only take you so far. He wasn’t invulnerable. If someone’s got wire around your throat, you don’t have the leverage to get at the guy, you’ve got a number of other trained assassins holding you down—you’re screwed. Stern: Actually, Ned made several moves. 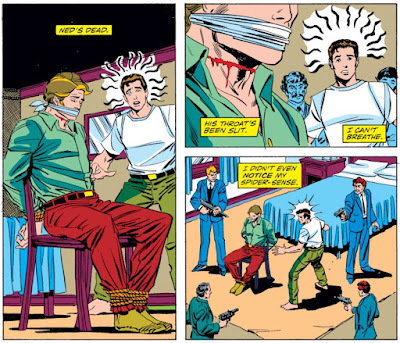 The issue (Amazing #289) showed four men breaking into Ned’s hotel room and threatening him. Ned reacted first by tossing pumpkin bombs, and then by shooting ray blasts that scattered all four of them. One assassin got off a shot, hitting Ned in the right shoulder. Then, another assassin grabbed Ned and applied a garrote. One man. He wasn’t even holding Ned down. In fact, no one was holding him down. Ned fought and died in a way consistent for a fit, athletic guy who thought he was the Hobgoblin. He had the Hobgoblin’s weapons, but not the Hobgoblin’s superhuman speed and strength—or the Hobgoblin’s willingness to kill. 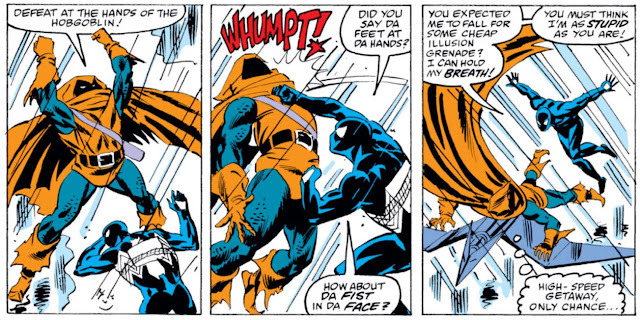 The real Hobgoblin never had the slightest problem with killing people. He wouldn’t have simply scattered those assassins, he would have blasted holes in them. Any assassin who survived to fire off a lucky shot, or tried to break the Hobgoblin’s arm, would have been pulped. Given the way the attack unfolded, a man with the Hobgoblin’s strength and speed would never have let anyone get that garrote around his neck in the first place. One of the fun things to try and figure out when rereading these comics, was which scenes were Ned acting as the Hobgoblin, and which were Roderick. I know this is impossible to do with any certainty, since DeFalco wasn’t writing the stories with that conceit in mind, but it’s an extra layer to think about now. Knowing that Roderick has a wimpy brother, makes those original scenes written by DeFalco, where Kingsley is scared and subservient to the Hobgoblin, not only work perfectly, but much more enjoyable. It’s pretty remarkable how well everything fits with Stern’s original plan, and how over the course of 10 years nothing happened to make it impossible to apply. David: I still maintain that the way I resolved it was pretty much the only way to approach it. I fully cop to it. It was my idea. And all things considered, I think I did the best I could. I’m still proud of it, and to this day, I have no regrets. Like it or not, you have to admit, it was an unprecedented way to handle it, and it hasn’t been done since. Stern: Overall, Amazing #289 turned out to be a win/win situation for both of us. Peter devised a one-of-a-kind story—no argument there—under battlefield conditions. And it made possible the story that I eventually got to write. David: I was aware that Roger eventually did his story with Roderick Kingsley. And I was amused that, for a number of the fans, the response was, “Eh, so what?” Because at the time, that was our response! But I certainly wasn’t upset that he did it. Why in the world should I be upset that Roger decides to come back and take this character that he created and do the story that he wanted to tell? After years and years of not being used, the Hobgoblin would finally return to the spider books as part of Dan Slott’s “Big Time” opening storyline. 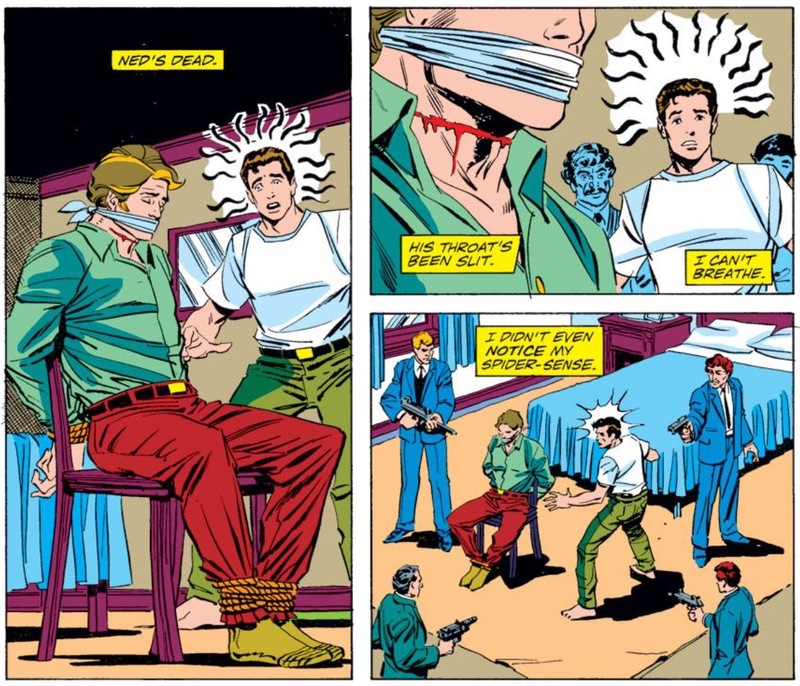 The character appeared to be killed at the hands of Phil Urich, who became the new Hobgoblin, angering some fans at the time. I remember being upset that they had brought back the iconic interpretation of one of my all-time favorite Spider-Man villains, only to almost immediately kill him, but I quickly decided that Roderick Kingsley really had very little to do with what had made the Hobgoblin great (up to that point, his real identity has been expanded upon to great effect since). I’ll let Ron Frenz close it out. 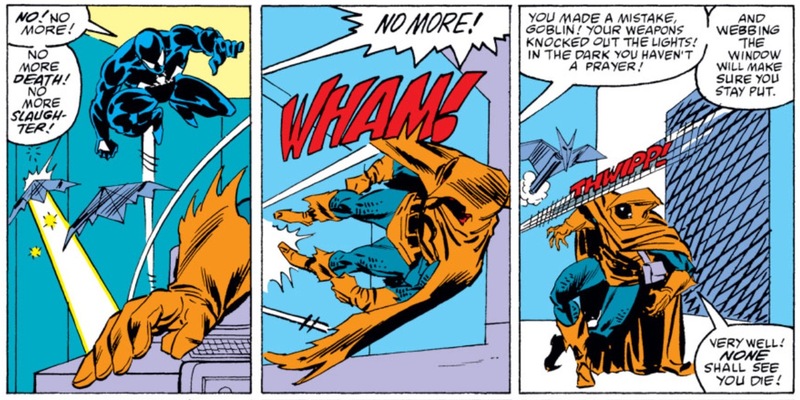 Frenz: The Hobgoblin is a cool character and he does have weight and I think part of the reason for that is because he’s been, primarily, only handled by Roger. And Roger has steered his destiny so clearly, by coming back ten years later and doing Hobgoblin Lives, that the Hobgoblin is one of those very few pristine characters out there, when you think about it. He’s not a character that’s been passed around like a two-dollar whore!